The Smallprint: I’d like to thank Nubra Ecolodge for hosting my stay with them. As always, the stories, experiences and opinions expressed here are purely my own. This post may contain affiliate links. For more information on what type of organisations I collaborate with, please read my Editorial Policy. The Road from Leh to Nubra Valley. It had been touch and go if I would make it to Nubra Valley – the place I’d been most looking forward to on my Ladakh trip. The road from Leh to Nubra Valley is around 115km and takes about 5-6 hours from Leh. The route takes you over the spectacular Khardung La Pass – along the highest motorable road in the world – and up to heights of 5,600m. To say the views are breathtaking would be an understatement. Khardung La – the highest motorable road in the world. At the top of the pass, chai, obligatory photo ops by the signs, and sights of the mountain-side festooned with Tibetan prayer flags await. Roads in Ladakh are of varying quality (some are paved, some are not) but are invariably narrow, winding, and a little scary at times if (like me) you don’t have a strong head for heights. Driving at night is definitely not recommended. Descending from the pass and winding through the mountains, the view of the Shyok river and Nubra Valley suddenly comes into view. Two thirds sand and soft mud and one third water, to the eye it can be hard to determine where the water begins and ends. Planning to visit Ladakh? Check out my post on Trekking in the Sham Valley here. After crossing the Shyok river (the long way round as one road had been flooded by glacier melt water), I arrived on the outskirts of the village of Sumur in Nubra Valley to stay at Nubra Ecolodge. Sumur is a small village and a popular base for exploring the valley. At an elevation of just 3,100m, it’s one of the lowest points in Ladakh, and you can feel the difference. Especially after going over the Khardung La pass (where giddiness temporarily sets in), I personally found it far easier to breathe in the valley compared to in Leh. In Sumur itself there is a small monastery, a traditional Ladakhi house that dates back hundreds of years and is open to visitors – with possibly the most charming old lady you’ll ever meet to show you around. Be warned, you will be offered salty Butter Tea! For those who want to see a more visually stunning monastery, Diskit gompa is not far away on the other side of the river. If outdoor activities of the non-walking kind are your thing then there are options to explore the sand dunes next to the river bed in desert-buggies, or even go and see (or ride if that’s your thing) camels of the 2-humped (Bactrian) variety in some small dunes. It’s one of the few parts of the world where the Bactrian Camel can still be found as opposed to their far more numerous one-humped cousins. Love the hills but can’t make it to Ladakh? India’s hills of Himachal are perfect for monsoon road trips! The main reason for my visit to Sumur, however, was to stay at Nubra Ecolodge. Nubra Ecolodge is run by a local Ladakhi family who have worked on the desert land (Ladakh is – despite appearances – a desert) and cultivated an organic farm which is as self sufficient as possible. Instead of seeing itself as a resort or hotel, Nubra Ecolodge is a place to stay to experience a bit of local Ladakhi life. It’s also a place to just unwind, enjoy the silence and get lost in watching a big sky full of stars. Nestled between two mountain ranges, the lodge offers a selection of glamping tents (bedded tents) and cottages set around the organic garden. Nubra Ecolodge is set in prime position to enjoy awe-inspiring views of the still snow capped Ladakhi range peaks in front and the dusty Karakoram sitting sternly behind. I stayed in the main house, which is also home to some guest rooms above the dining area, and had views of tree tops backing on to the Karakoram. If you want the wow factor of your own private terrace gazing onto the sand dunes, river and mountains, I’d recommend one of the lodge’s new cottages. The ecolodge uses as much fresh, organic produce from the garden as possible, and in addition to Indian staple curries and dal, serves Ladakhi foods such as Khambir (local wholewheat bread). I never tired of snacking on the apricots from the trees in the garden, and the food was some of the best I had during my trip. Rooms at Nubra Ecolodge – with some of the comfiest beds ever! In addition to the organic garden and low-impact tented accommodation, Nubra Ecolodge uses solar power for all its hot water (meaning deliciously hot showers on demand) to lower its environmental footprint. There is plenty of filtered drinking water available, meaning you can happily forget buying plastic bottled water (and use a refillable bottle instead). The lodge does its best to encourage guests to drink the fresh Himalayan filtered water as opposed to adding to Ladakh’s plastic waste problem through buying bottles. Water supply in Ladakh remains a problem however – contrary to what you might think from its rivers and green valleys – Ladakh experiences hardly any rain because of its desert climate. River and steam water is 90% glacier melt from the winter snows. With increases in construction and tourism, the pressure on water resources is mounting, so be mindful of what you use for bathing. Fresh apricots were constantly on offer at Nubra Ecolodge! Getting to Sumur Nubra Valley. The majority of travellers hire a private car with driver. In Ladakh, that’s not particularly cheap (by India standards), with rates at about 3,500 rupees per day. It also means a procession of cars on the road going up and down Khardung-La Pass in high season (Summer). The only alternatives are taking a bus (which runs 1 or 2 days per week – not particularly helpful), or it is possible to take a bolero (a shared jeep) from Leh to Sumur or Hunder. Prepare for a good few bumps, try to get the front seat and get ready for lots of bonding with friendly locals! Getting a Permit to Visit Nubra as a Solo Traveller. If you’re travelling in a group of 2 or more, getting a Nubra permit is not a problem. You just fill in an application form and give your passport + permit fee to any reputable travel agency and you will usually get the permit back within 1-2 days. Foreign Solo Travellers on the other hand, are not allowed. I’m not sure what is particularly dangerous or offensive about us, but anyway… them be the rules. Fortunately, rules can often be – erm – bent a little. But it did take a bit of effort. Initially I approached a few travel agencies asking if they could help – but none I approached were willing to come up with a creative solution. In the end, the manager of another lodge in Nubra which I was later staying at (and happens to be a foreigner) applied for a permit with me so that there were two of us on the application. An alternative would be finding a friend / fellow traveller at your hostel or guest house in Leh and asking nicely if you can submit an application for them going with you. This doesn’t mean they have to come with you, but it does mean you will have to borrow their passport for a day and pay for an additional permit (around 700 rupees per person). I travelled on my own by car to Nubra and was not questioned as to why there was only one of me. If challenged, popular excuses are that your companion is suffering from altitude sickness / has gone on ahead / is coming later. The authorities hear these excuses a lot, and are not bothered – from what I was told. If you feel uncomfortable with this kind of “workaround” (which is at your own risk) then an alternative is to take a share taxi to Nubra and ask that agent to apply for your permit as part of that group. Bon voyage! 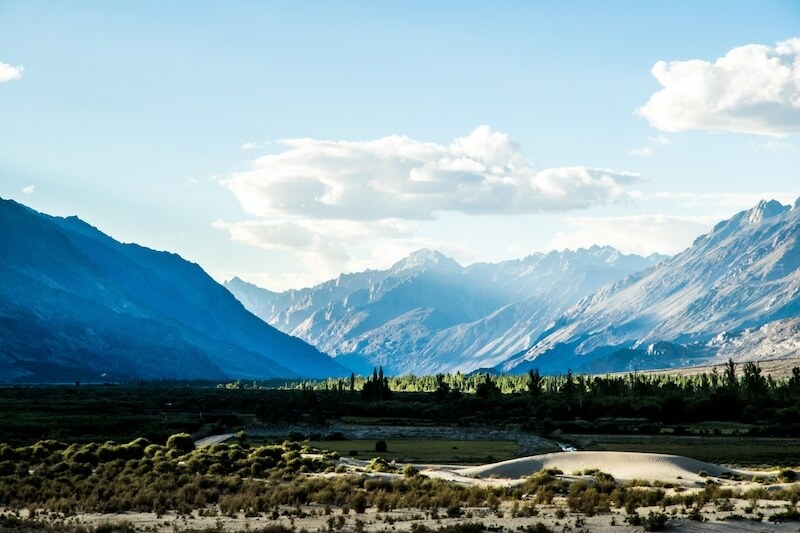 Have you travelled to Ladakh and visited Nubra, or have you been over the Khardung La pass? Let me know about your experiences in the comments below! Good to know you made it to Ladakh and had a great time. The photos are gorgeous as usual. Were you able to find some NGOs as i remember you wanted to volunteer for a bit? I’d love to visit here, and the eco lodge is one of the nicest set ups I’ve seen! Love that they keep their environmental footprint low! This looks like a beautiful place to visit, glad you were able to sort out the permit issue, it sounds like a bit of a PITA! Ladakh is a very beautiful place. I really like it. I am planning a trip with friends for next month. Thanks for sharing. Love that they keep their natural impression low! This resembles a wonderful place to visit, happy you could deal with the allow issue, it sounds like somewhat of a PITA! Thanks For Informative post !! Can’t wait to travel here soon! The Nubra Valley is gorgeous! We’re planning to visit next year and hopefully, we’ll get to stay at the eco-lodge and hike around a bit.